Thermory and Ha Serv have announced a planned merger of their business operations, thus becoming the world’s leading and largest producer of thermally-modified wood. The current offering of Thermory products remains available throughout the U.S. and Canada via Thermory USA, with the overarching parent company–Thermory AS–still headquartered in Tallinn, Estonia. 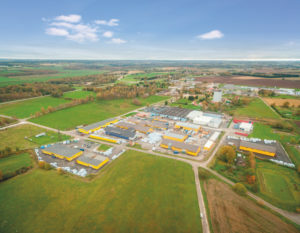 With European-based headquarters and production facilities, Thermory is already the largest producer of thermally-modified hardwood worldwide—exporting to more than 50 countries and having over 20 years of experience in modifying wood. Ha Serv is a manufacturer of thermally-modified sauna materials and ready-made saunas with facilities in Estonia and Finland, the birthplace of the sauna. “Thermory and Ha Serv are the most technically-sophisticated producers of thermally-modified wood in the world so this merger really is an exciting time in terms of future product development across all our categories,” explained Kevin DeMars, Principal of Thermory USA. “And it will immediately yield substantial savings in raw materials and production costs, allowing the overarching Thermory brand to accelerate its growth throughout the U.S. and Canada.” Thermory AS now employs more than 500 people worldwide.